Implementing a regular exercise routine for residents can have a dramatic impact on their health and well being. There will always be those who choose not to participate, all you can do is try. Make sure you run an exercise program at least twice a week to help residents maintain their best physical function. The old adage is true: Use or Lose it! Convincing those who are apprehensive to participate in group exercises can be a challenge. Gently point out the benefits of exercise. Mitigate their fears - assure them that they are not too old or too weak and that there is no minimum skill level required. Remind them that getting started is the hardest part. Invite them to come along and watch an exercise session. Be enthusiastic and engaging when running group exercises - remember that positive energy is contagious! Or ask residents for suggestions - they could even do an arts and crafts project to make and decorate props. Add ribbons to a bottle. You could add water to the bottles to make them heavier if you need to make the workout more challenging. Find suitable music to accompany your exercise routines. Music has the ability to lift spirits and put residents in the right frame of mind to move. You could use background music or sing along music depending on your routine. Residents may not have the endurance or desire for a long exercise routine so you may want to combine it with a sing a long or trivia questions after the routine or even in between exercises. I prefer to use a shorter workout that can be repeated if the residents really enjoy it. I like to have the residents count forwards and backwards to 10 or 12 by ones, twos or threes to easily add a cognitive aspect of the session. Before starting a routine, remind the residents if they get tired or uncomfortable, to stop at any point. Tell residents to do some kind of movement during an exercise even if they can not do the exercise as shown. Any motion is better than no motion. Remember to face the residents positioning yourself so all can see you. Some experts say to stay in one spot so the residents can focus on your movements. Alternatively, move around the room addressing residents by name who are having trouble, giving them necessary cues or assistance. Take a short break after doing two or three exercises by having the residents slowly breathe in through their nose and out through their mouth two or three times. Here is a gentle and low impact seated chair exercise routine using props. Be aware that seated exercises may have contra-indications for some clients. Consult clinical staff before starting the session. Take what suits your clients from the session below or devise your own program. Ask residents to say hello to the person on your left and then repeat on the right side. Repeat two or three times on each side. Look up and then look down to your lap or the floor. Repeat two or three times. Pass out props - encourage residents to look at how pretty it looks when they move the props during an exercise (visual stimulation). Sing the first two or three lines of “In My Merry Oldsmobile” several times. Substitute the names of residents and /or types of cars if you wish. Throwing a baseball. Sing, “Take Me Out to the Ballgame”. Play a short game of kickball, bat the balloon with your hands, or any other movement game of your choice. You can find hundreds of ready made short exercise sessions on youtube! You can search for suitable ideas and inspiration for low and high funcitoniont residents. I teach chair exercises for three homes, three days a week. Each session is 20 minutes All that can participate, love it. We start with Yoga warmups, then start with the head, neck, arms, core, bending over, for the lower back, kicks, ankles and they circles, with legs extended. This is a B & B session, working on their bodies first, then their brains. They also love being challenged by the cognitive exercises and use many from this site. We wrap with stories from the "Chicken Soup" books and I make sure, I speak with each resident, individually. It is a win/win session. Hi Sherry, thank you for sharing. Congratulations on doing a wonderful job. Do you use music? What sort? Excercise is such a great thing. i have my usual participates but try to get the residents out that sit in their rooms too much. Gotta make it interesting. Like the idea of frisbees. We use balls and have done paper plates and rubber bands. We always follow with a drink and then activity. That's why I Love this site. Have used so many things off here and the possibilities are endless. Thank You !!! Hi Barb, your exercise classes sound like a lot of fun! Thank you so much for your feedback and kind words, we appreciate it so much! We play and do actions to the Macarena. Hand, palms, shoulders,ears, tummy, hips, wiggle wiggle, clap. They love it. Also march to "When the saints come marching in" and the chicken dance sitting down. Lots of fun. 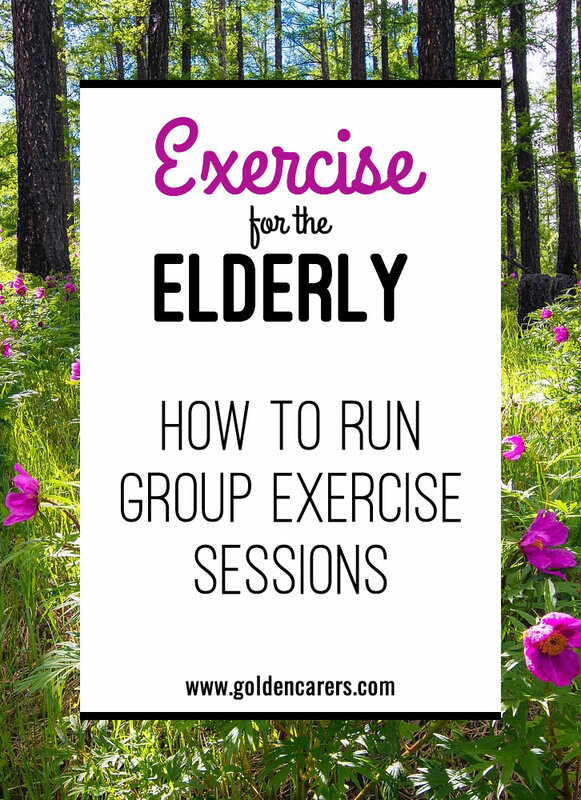 Do any of you offer a reward to the residents for participation in exercise groups? We were giving out "auction bucks" and then the residents could collect them to shop at a quarterly country store we put on. It had its up and downs and now we are looking for a different idea. Hi Darlene, one idea is to focus on the social component of exercises. For many elders, socialising is as (or more some) important as the physical benefits. Have a novelty food or drink every week after the exercises (tea tasting, foreign biscuits and cookies). Also, invite an enthusiastic personal trainer to talk about the benefits of exercises and hopefully inspire your clients to keep coming back. Best wishes. All exercises are good,we do them all,I was a dancer & play the Piano,the sitting on chairs go down well.hold legs up point toes down then up,down up.while legs are up twist ankles round & round each way.Gently,slowly raise arms up in front while breathing IN, lowering arms down Out,4 times. repeat to breathing IN, then move arms out to the sides holding the breath,breathing out with arms coming back to front & back down,4 times.Close eyes relax all muscles fold hands on lap,let shoulders drop,breath in &out a few times,this is the slowing down we use to finish Exercises.Use Music always, especially the old songs. Wow, this article and the suggestions in the comments are great! Thanks so much! I "borrowed" an idea from an activity supply catalog and adapted it for our tenants: On a lightweight and large children's ball (solid color), I wrote different movement suggestions. For example: "Do the actions to one verse of "Head, Shoulders, Knees, and Toes" or "Shake hands with the neighbor to your right". Then we throw the ball to each other (gently!) and wherever the tenant's right thumb lands on the ball, he or she reads the printed suggestion underneath out loud and "leads" the action! All of this can be done while seated. Tenants can even kick the ball to each other, and then when they (or if they can't bend well, I) pick up the ball, whatever suggestion is under their right thumb, that's the action we do! Great ideas, thanks for sharing Nori! Thank you! This is really good and will be very helpful! Thanks for the creative info! Just what we needed! I went to thrift stores and collected Frisbees as props. We pretend like we're driving and the frisbee is our steering wheel. We need to turn our necks to do our shoulder checks etc... There are a variety of other activities you can do with them as well. I also use thera-bands to strengthen and add variety. With a good joke at the beginning, good music throughout and a back rub at the end, it's a winning ticket. By offering variety and social interaction, I was able to take the group from 4 to 14 participants in 2 weeks time. You could also take PVC pipe, fill with sand and cap each end to create varying weight bars. Wonderful Edie! Thank you for sharing! I was always a big proponent of exercise. After a time I like to vary the routine to keep it fresh. Kristin 12th Sep 2017 Activity Assistant 17 Years! We are always looking for ways to promote exercise program, and you have given good examples.